Why I Chose This Book: This book had so much buzz surrounding it, and it was one I didn’t shy away from. As a Printz honoree and National Book Award finalist, I knew Lockhart was a lady I needed to know. I was also looking for a summertime read that contained beaches, boys, and love. I wasn’t disappointed. Be prepared to LIE. We Were Liars is written so poetically. Lockhart has the ability to invoke such raw emotion in her writing and characters. This book is one that took me out of my sleepy midwestern town and onto a sunny costal beach. I love books that remind me what it is like to be seventeen, and We Were Liars does just that. 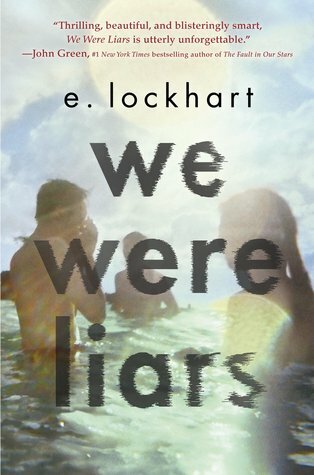 Written in the perspective of Cadence Sinclair, she tells the story of her life with the Liars as they spend their summers on their family’s Massachusetts island. Cadence loves her cousins Johnny and Mirren, and toes the line of friendship and romance with fellow Liar Gat. The Liars are everything teenagers should be: spirited, hopeful, and full of youth. They rebel against the antiquated wishes of their family, and seek to end the patriarchal family ties that bind them. The relationships between the Liars are complex, and the secrets they keep are intoxicating. Lockhart blends a mixture of privilege and pain when creating each character, causing the reader to both experience feelings of love and hate. If I told you about the ending, I’d have to lie. Parts of this book are painfully slow. While the writing is beautiful, characters authentic, and story captivating; it does not move quickly. Thankfully Lockhart strings along secrets and clues to a much bigger mystery that leaves you breathless. This was a beautiful summer read that left me in tears. Do yourself a favor and read this book, then LIE. I've seen this title around a lot. I might just have to give it a try. It sounds very interesting.